Yom Kippur 2015 …. Who by Fire? A few hours before Yom Kippur, the Jerusalem streets are already quiet. A solemnity falls on the city. As I prepare my meal, I’m thinking how fortunate I am to live here and serve as your eye-witness to the miracles of Hadassah. As we stand before our Maker on this Day of Awe, we can feel that being part of this sacred work balances our regrets and misdeeds. Sorry–Iget emotional about this. Today, I’m thinking of a young woman named Inbar who, thanks to you, is home with her family for Yom Kippur. Inbar and Ori Azrak, a young sabra couple with three small children, needed a romantic break at the beginning of August. Short on cash-she’s a teacher and he’s just starting college after a long stint in the IDF-they couldn’t splurge on a hotel. Inbar and Ori came up with a plan. They would stay with Inbar’s grandma in Jerusalem, go out to dinner, and do back-to-school shopping. They’d take long walks along the ancient byways of the city. Inbar’s parents who live in a rural community in the Galilee, agreed to take the grandkids. They had a wonderful two days and felt recharged. They were on their way home–Ori was driving , near the northern Jerusalem neighborhood of Pisgat Zeev, when suddenly, the glass window on the passenger’s side shattered. A deafening boom was followed by the flash of fire as a Molotov cocktail exploded in their car! “Get out, get out,” yelled Ori. Trained in battle, he was out of the car in seconds. Inbar heard her husband’s voice through a daze, realizing she was in a terror attack but at the same time denying that she was in a terror attack. “Get out, Inbar.” She tried, but the seatbelt was stuck. The metal was scorching. Her skirt was on fire. Before Ori could get to her, she managed to press the button, and leap out. She rolled on the ground, trying to put out the fire that was engulfing her. “I’m alive, I’m alive,” she kept saying to herself. “I can take the pain.” Ori was stomping out the fire when he looked up. The driverless car was rolling towards them. He and a passerby pulled Inbar out of the way of the burning car. . Through her shock, Inbar felt the additional internal earthquake. The children! No, they were safe at her parents’ home. Had they been in the car she wouldn’t have been able to rescue them. The thought made her feel faint. Someone was holding water to her lips. Then the ambulance, its sirens blaring, was speeding to Hadassah Hospital. First she was treated in the Swartz Center for Emergency Medicine. Then she was moved to the seventh floor plastic surgery department in the Sarah Wetsman Davidson Hospital Tower, where her lower body burns were treated. She needed the Tower isolation room, to prevent infection. She needed the couch for a family-member to sleep to provide the emotional support. Hadassah Hospital staff has long experience with the treatment of burns from war and terror. “We need to control infection and to minimize the area that will need skin grafts,” said Dr. Tomer Tzur, a senior plastic surgeon. Inbar was sedated to change the bandages. 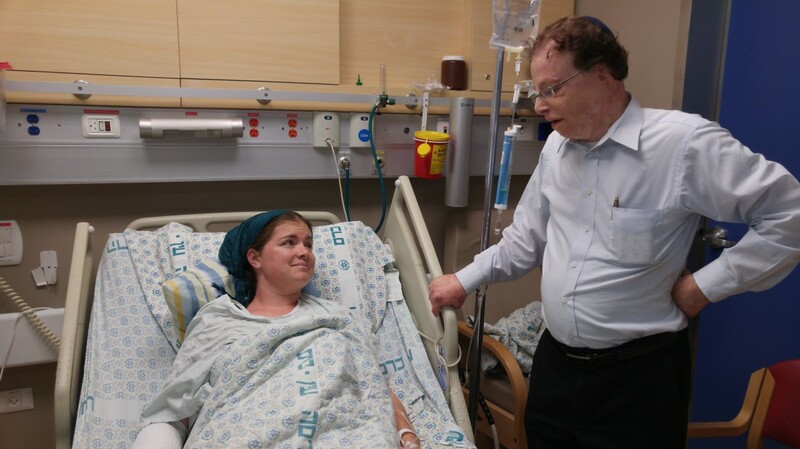 “I don’t know whom to thank first among the angels at Hadassah,” said Inbar, age 27. ”From the moment we arrived at Hadassah Ein Kerem, we had the most compassionate and most professional care. What a gift to have this beautiful and comfortable room where my family and guests can feel comfortable. It’s as if I got a hotel in Jerusalem after all.” Among her guests were Prime Minister Benjamin Netanyahu and Israel President Reuven Rivlin, as well as her students and of course, her family and three children.